Students from historically black colleges and universities at the Summer Institute for Emerging Managers and Leaders at UC Riverside. During the academic offseason, UC hosts thousands of high school and undergraduate students in programs aimed at sparking interest in areas of study that have struggled to attract women and minorities. The goal: excite students about these fields through hands-on research and mentoring. Packed with rigorous coursework, real-world projects and social support — including a few trips to the beach and redwoods thrown in — these programs are attracting a more diverse generation of students for programs that range from business administration to biotech. More than 300 high school students in the Summer Math and Science Honors Academy (SMASH) spend five weeks each summer living on campuses, engaged in cutting-edge math and science projects that will prepare them to pursue STEM degrees at top schools. It’s the kind of world-class academic opportunity that usually carries a hefty price tag — but not for SMASH participants. The academy is free for eligible students willing to commit to participating every summer from freshman through junior year. UC Berkeley, UC Davis and UCLA are among the campuses that host this national program, offered through the nonprofit Level Playing Field Institute, which aims to attract Latino and African American students to careers in tech. The effort has had impressive results: 95 percent of its graduates – most of whom come from low-income households – have gone on to college, with an academic focus on STEM fields. 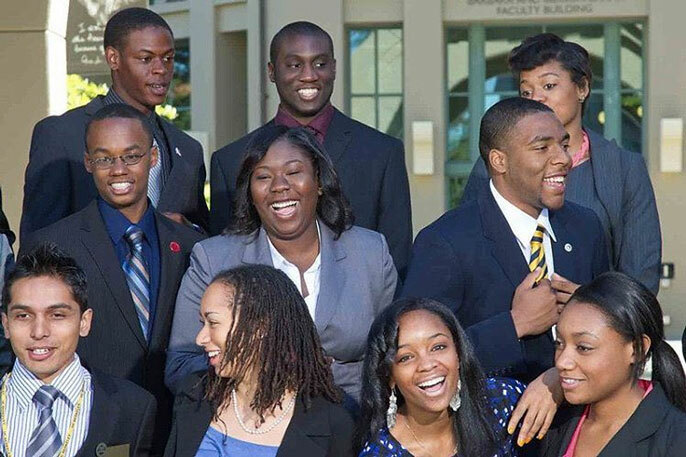 This month, 50 high-achieving students from historically black colleges and universities (HBCUs) and Hispanic-serving institutions (HSIs) are at UC Riverside, taking classes at the School of Business Administration, networking with area executives, and participating in workshops on applying for an MBA. The aim: recruiting top talent to UC’s MBA programs. The Summer Institute for Emerging Managers and Leaders (SIEML) is held each summer, rotating among UC’s six graduate schools of business administration. Participants in the all-expenses-paid program commit to participate in the two-week intensive for two consecutive years. Professor Tracy Johnson is the co-leader of the Bruins in Genomics Summer Undergraduate Research Program. Since the human genome was sequenced in 2003, the fields of genomics and computational biosciences have undergone rapid change and expansion. It’s now more important than ever for students interested in those fields to have access to state-of-the-art equipment and faculty who are on the leading edge of the field. UCLA’s B.I.G. Summer does just that: It offers undergraduate students from all backgrounds access to specialized biosciences training. Participants spend eight weeks living on campus, learning the latest techniques in genetic sequencing, bioinformatics, data analysis and programming. Open to undergraduates at UCLA and other schools, the program is targeted at students in groups underrepresented in STEM. Roughly 5,000 California teenagers participate in summer programs that give low-income students a chance to experience college-level coursework and campus life. Available through UC’s Early Academic Outreach Program – offered in more than 1,000 California public schools in communities with low college-going rates – the programs give high school students the opportunity to engage with peers who share their educational ambitions and to learn from top-notch educators who will foster their ability to learn. UC Davis anthropology grad student Mayowa Adegboyega credits the UC-HBCU summer internship with inspiring her to pursue an academic career. "I never knew this was a possibility," she said. A key factor in creating a more diverse college faculty is providing pathways and opportunities that will attract minority students to graduate degrees. One of the ways that UC is addressing the issue is through partnerships with HBCUs, in which undergraduates spend time on a UC campus and get a taste of what it’s like to go to graduate school. About 100 high-achieving HBCU students have spent the summer engaged in advanced research projects that range from studying underwater coral reefs in French Polynesia to creating next-generation, wearable electronics. A third of those who previously participated in the program and completed their undergraduate education have chosen to apply to one of UC’s graduate level programs, going into fields like marine biology and electrical engineering, where African Americans have been especially underrepresented. The university helps make graduate school affordable by offering financial support to participants who enroll. Students getting a jump on careers in medicine at the Fast Start program. Low-income and minority students are more likely than their peers to drop out or transfer from STEM majors, according to research from UCLA’s Higher Education Research Institute. The Fast Start program offered through UC Riverside’s School of Medicine aims to change those statistics. Through the five-week residential program, incoming freshman who are low-income or among the first in their family to go to college get a head start in challenging pre-med courses like pre-calculus, biology and chemistry. Students also tour labs and meet with physicians and grad student mentors who can inspire them to pursue a career in medicine.